Who created the Star Trek series ? What was Roddenberry's previous experience ? He was a successful director. He was a successful actor. He was a sucessful producer. He was a successful writer. What was the creator's original idea ? To produce a Western series. To produce a mature science fiction programme. To produce a controversial series. How long did the second series last ? How did the series become a success ? It had a very large audience. It built up a following through repeats. What criticism can be made of the series ? It is too simplistic and often sexist. What was Roddenberry's original idea for a female character ? He wanted a woman as a captain. He wanted a woman as a doctor. He wanted a woman as a science officer. Why was this idea rejected ? There weren't enough people watching it. NBC thought it was sexist. NBC didn't think audiences were ready for it. 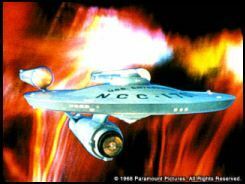 How did Roddenberry see THE NEXT GENERATION ? As a continuation of the original story. As a different type of TV programme. As a chance to correct the faults of the original series. As a failure in comparison with the original series. What was innovative about Jean-Luc Picard ? He wasn't the usual type of hero. He was played by an unknown actor. Why was the inclusion of Lieutenant Worf significant ? He represented the first alien in the crew. He was a character in the original series. He represented a peace gesture. He was a typically heroic character. When did Roddenberry die ? How does his legacy continue ? His son produces the new series. He made other similar series. He wrote some stories which were used. Later series continue to follow his vision.